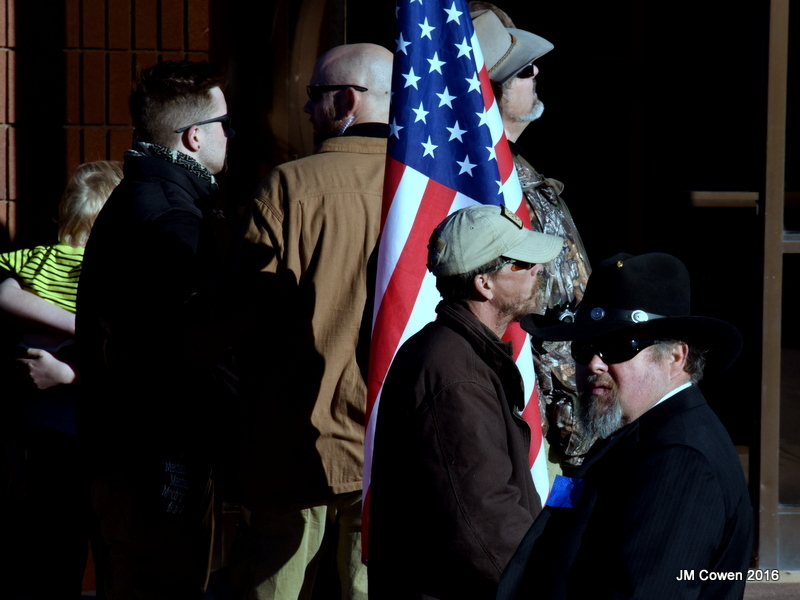 KANAB, Utah, Feb. 5, 2016 (Gephardt Daily) ─ Robert “LaVoy” Finicum was murdered by the FBI – so say hundreds of people who attended his funeral service, and they say they will never forget him. Such were the emotions Friday in Southern Utah, where more than a thousand people gathered in memory of the Kanab-born rancher who was shot to death Jan. 26 in a confrontation with FBI agents and Oregon State Police. 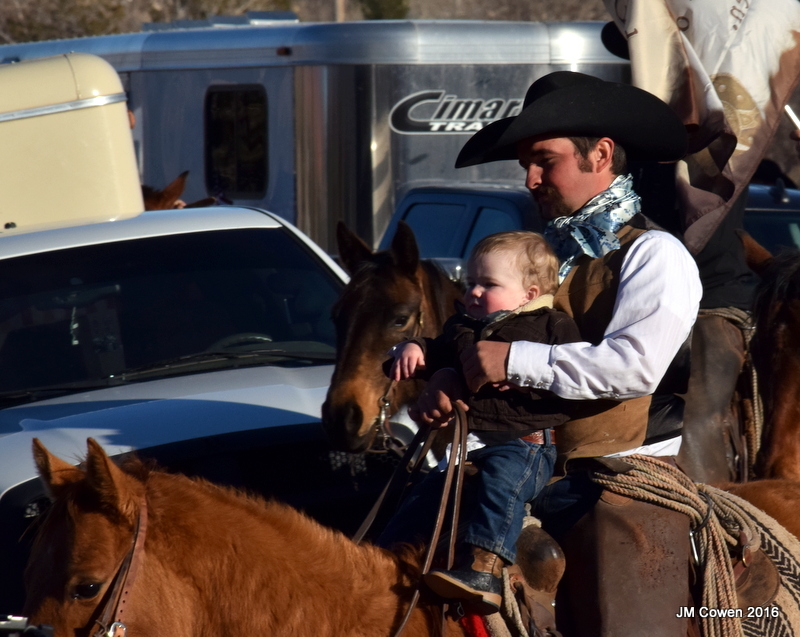 Crowds began arriving early to the tiny tourist town along the Arizona strip. 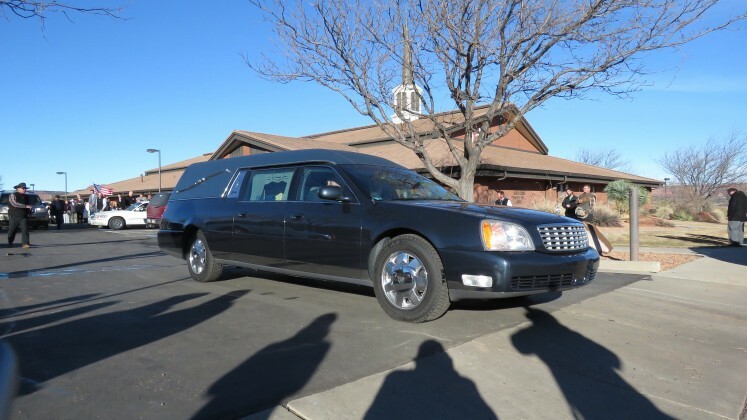 A steady stream of mourners ─ many of them militia members ─ gathered at a local stake center for the Church of Jesus Christ of Latter-day Saints to pay their final respects. 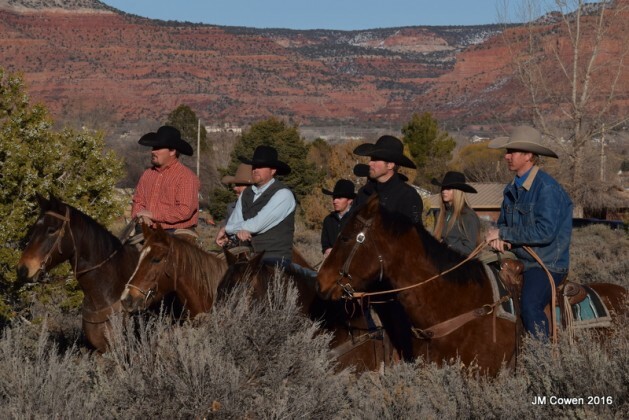 Finicum, 54, was well known and beloved by many in the Kanab area. That sentiment was echoed again and again Friday, especially by Finicum’s children, each of whom spoke to the somber crowd that packed the small-town chapel to capacity. 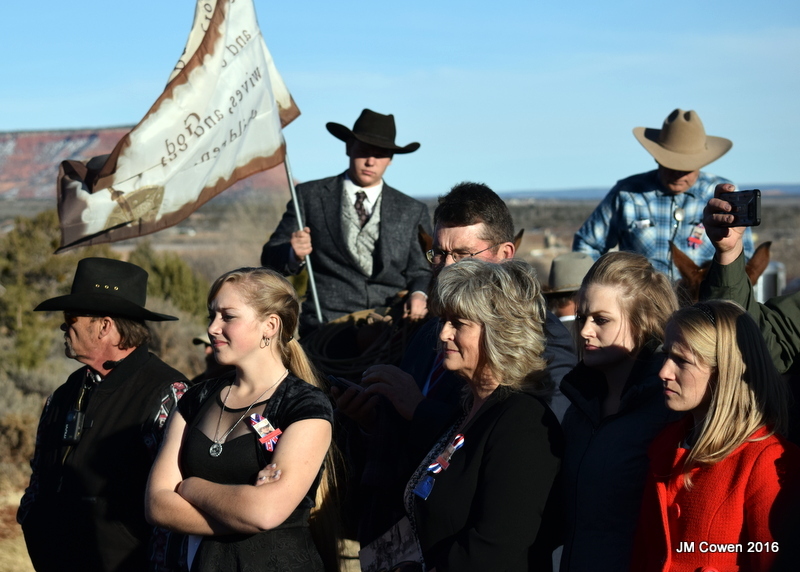 Finicum’s children remembered their father as a deeply religious man, dedicated to his family, his country, and his fellow ranchers. Outside the chapel, the sadness over Finicum’s death was mixed with anger and suspicion. 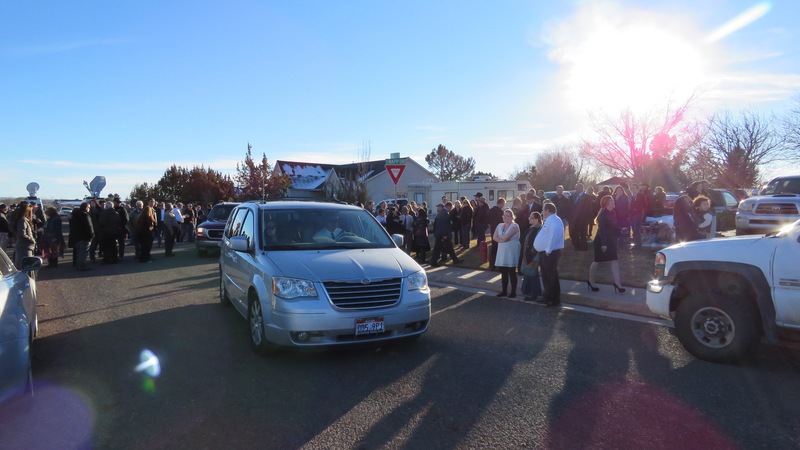 Groups of stern-faced militia men guarded the entrances to the stake center’s parking lot while others provided security details inside the chapel. 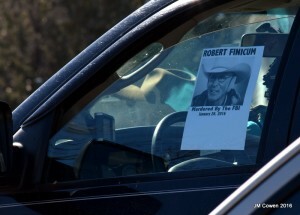 Some distributed fliers bearing a photo of Finicum, with the caption, “Murdered By The FBI,” as local law enforcement officers looked on. Many militia members traveled from out of state to attend the service, driving from as far away as Montana. 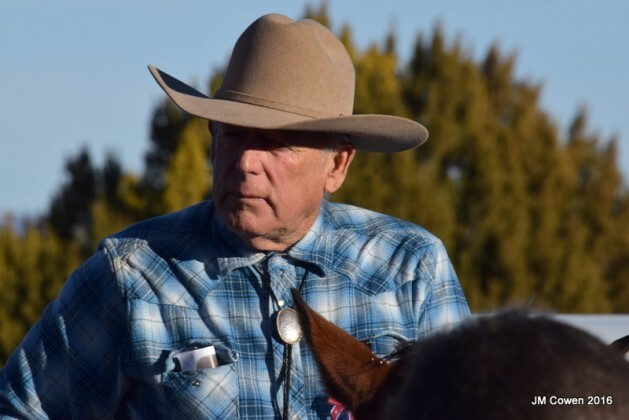 Among them was Cliven Bundy, the Nevada rancher whose clash with the Bureau of Land Management over grazing rights briefly led to an armed standoff with federal authorities in 2014. 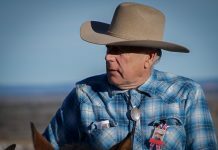 It was then that Finicum joined forces with the Bundy family, and ultimately became a spokesman for militia group, Citizens for Constitutional Freedoms, the same group that occupied the Malheur Wildlife Refuge. 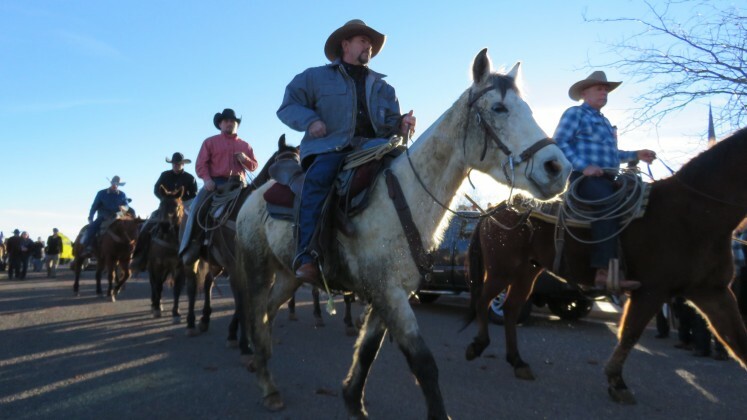 At the time of the January refuge takeover, the group’s leader, Ammon Bundy, Cliven’s son, said the action was a show of support for fellow ranchers, Dwight Hammond Jr., 70, and son, Steven Hammond, 46. 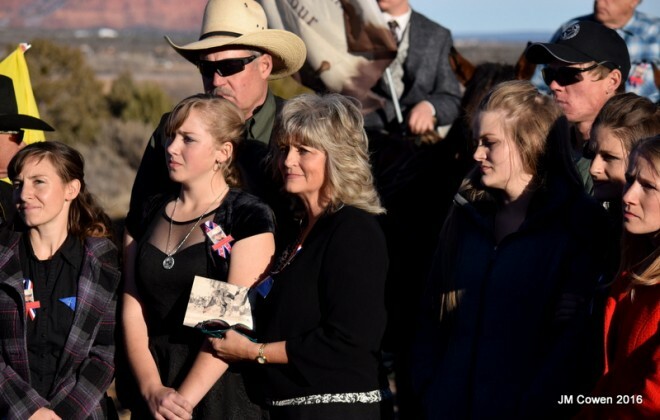 The Hammonds had been convicted of arson in 2012 for setting fire to federal land, and had just been ordered back to prison after a judge ruled their initial sentences were too lenient and failed to meet federal sentencing guidelines. Finicum was a spokesman for – and occupier of – the refuge back on Jan. 26, when he and a group of others left the grounds for a meeting in the nearby town of John Day. 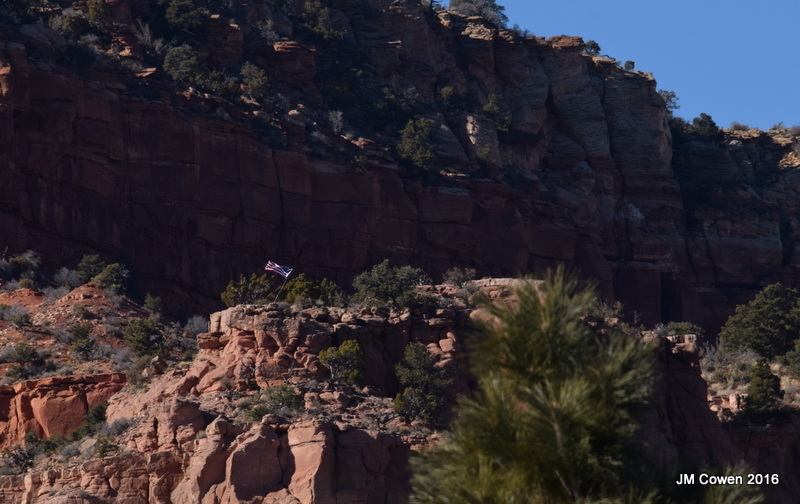 It was during that trek that law enforcement agencies stopped the two vehicle caravan which led to Finicum’s shooting. After fleeing the initial traffic stop, Finicum swerved into a snowbank to avoid a clandestine road block which stretched across Highway 385. He leapt from his vehicle with his hands in the air, but was shot to death moments later when officers believed he was reaching for a gun. Militia group supporters say the action by law enforcement agencies was nothing short of an ambush. The FBI released surveillance video showing Finicum reaching for his waist before being shot. Authorities say they found a 9 mm pistol in Finicum’s pocket, and that the shooting was justified. 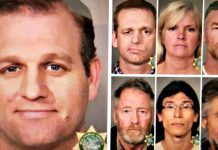 Also traveling in the caravan that night was Ammon Bundy and his brother Ryan. 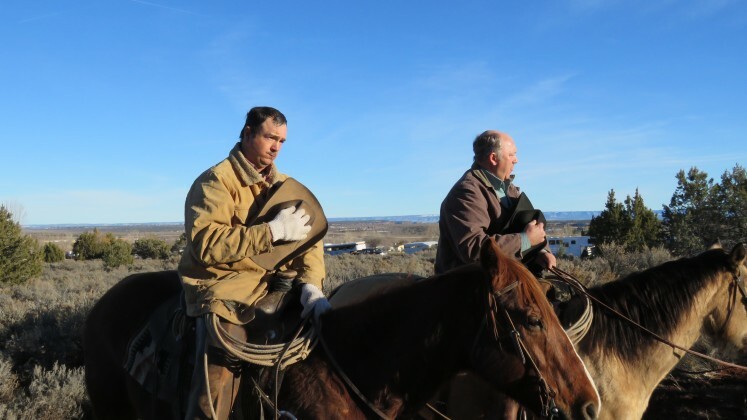 Since then, the Bundy brothers and 15 others have been charged with conspiracy by the federal government. Friday afternoon in Kanab, immediately after Finicum’s funeral service, dozens of mourners took to horseback in a final farewell to the fallen rancher. Clad in traditional western garb of cowboy boots and wide-brimmed hats, they followed the hearse that carried Finicum’s simple wood coffin to the family’s ranch for burial. 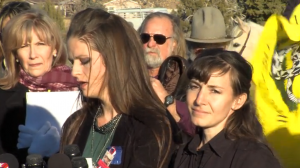 Moments later, two of Finicum’s daughters, Belle Collier and Thara Tenney, addressed the media, and compared their father’s actions to those of George Washington, Thomas Jefferson and even Joan of Arc. 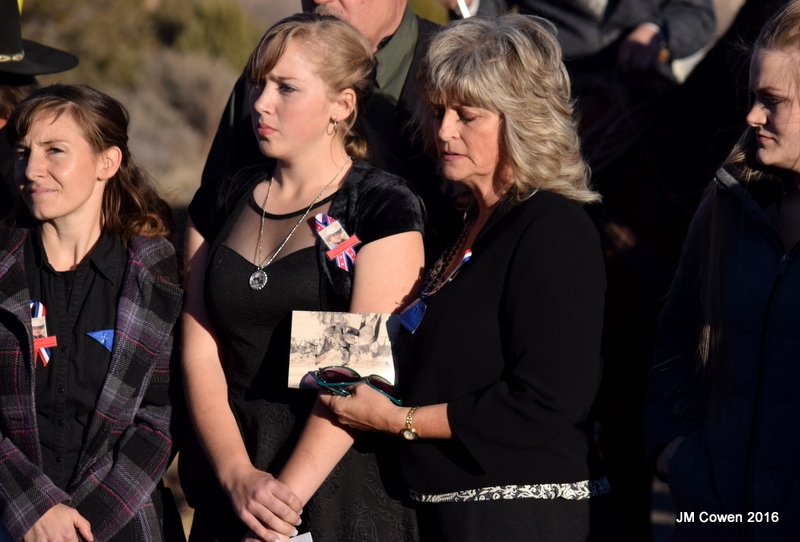 Collier and Tenney said the FBI intentionally murdered their father, and the two accused the press of providing a “false narrative” about Finicum’s actions in the Oregon standoff. “We don’t want the FBI’s bias. We don’t want the media’s bias. We want the truth,” Tenney said. 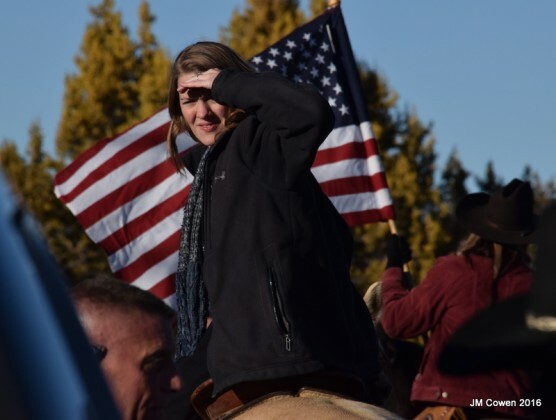 Collier asked listeners to give Finicum’s story some thought. 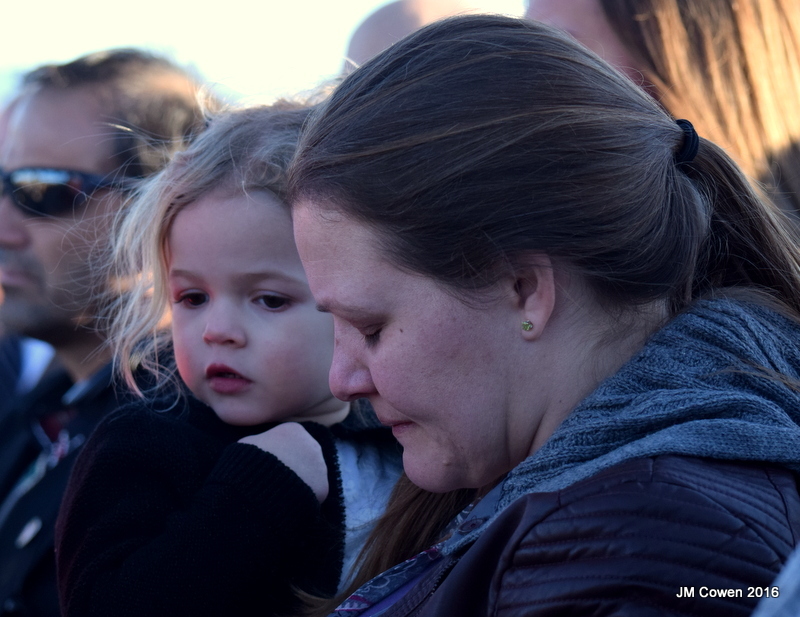 “Whether or not you believe that our father did the right thing, we step forward to publicly ask: who are we as Americans?” she said. “Who are we as human beings? 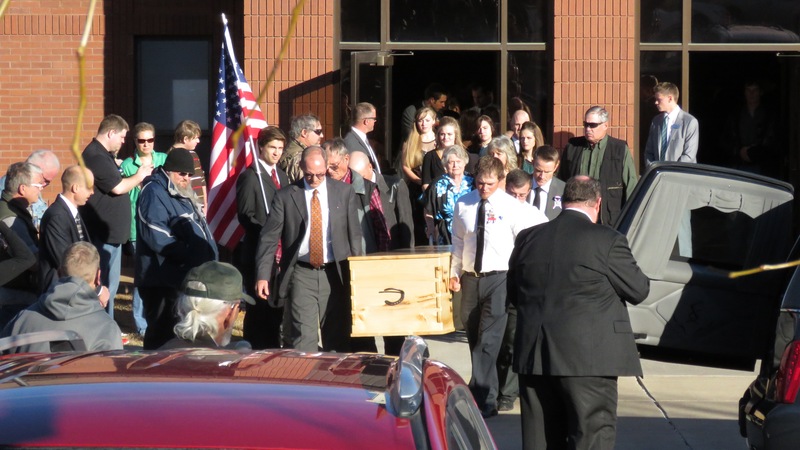 Do we now believe that mere words justify the use of deadly force? Do we believe that peaceful actions justify the use of deadly force? Do we believe that two hands up in surrender justified the use of deadly force?,” Collier asked. To see a video of the Finicum family’s entire statement to the press, please click on the video player above. Previous articleWhich Candidate Wins Pop Culture Race? 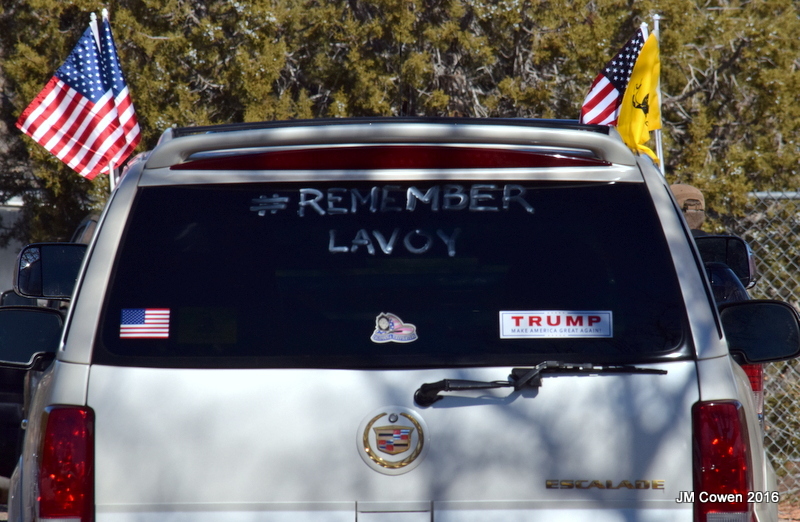 RIP LaVoy, you will NOT be forgotten. God, please Bless and heal all hearts with those close to this situation. May the truth become knowledge to MANY so that justice and freedom will prevail for all. I pray that citizens will study, learn and share as much as they can so MANY will STAND. And God, Please Bless America, Amen. This is stated as fact, but we lack sufficient information to make that judgment. An alternative is that he was fired on and hit by bullets from several different shooters while he still had his hands in the air. Shawna Cox says he was wearing a bulletproof vest, which would have staggered him without immediately dropping him. 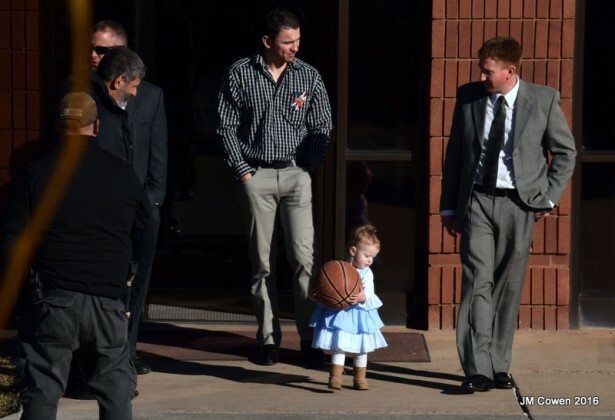 Alleged justifications aside, he had no gun in hand and was surrounded. The FBI could easily have taken him alive, if they had wanted. Words cannot express the disgust I feel. 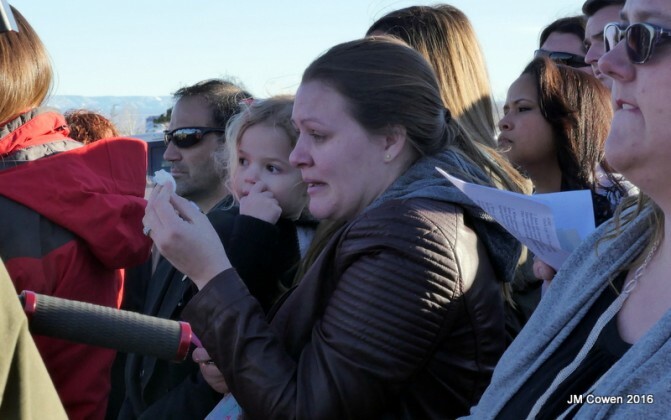 This family lost their loved one. Why? Because he defied the Federal government? It’s time to fight back. God help us. There will be another civil war if these atrocities continued. Maybe that’s what the corrupt “rulers” want. This right here is why we must stand together. Because he broke the law and defied LOCAL law enforcement. He had every opportunity to not die. The truth. He reached into his jacket. He’d swarn the FBI would not take him alive and he got what he wanted. I agree with all of the comments above. 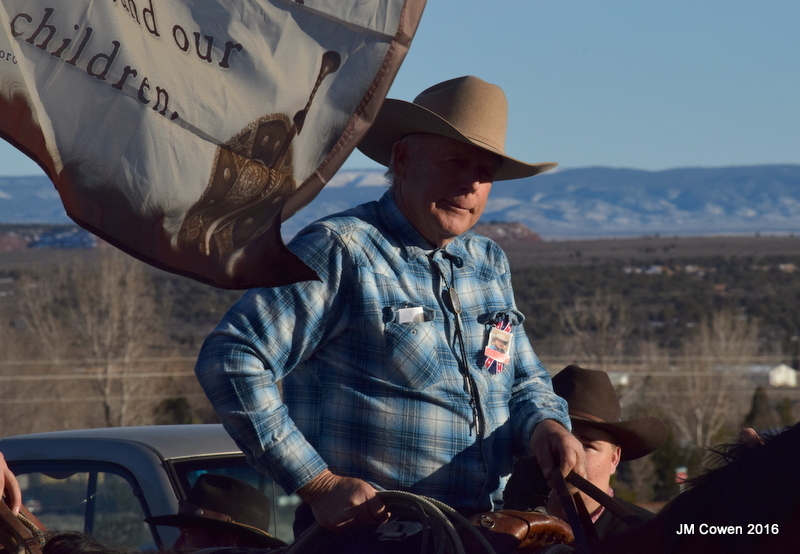 LaVoy Finicum has found an eternal place in the hearts of tens of thousands of Americans. He has greatly affected my life and thoughts in a massive way. May LaVoy’s dignified life and principles forever be engraved in the hearts and minds of good and just citizens of this nation. May we never forget and may we take up his yoke of defending our inalienable given to each of us by our Creator, our Father in Heaven. Rest in peace LaVoy, we know your work continues here and in the eternal realms. 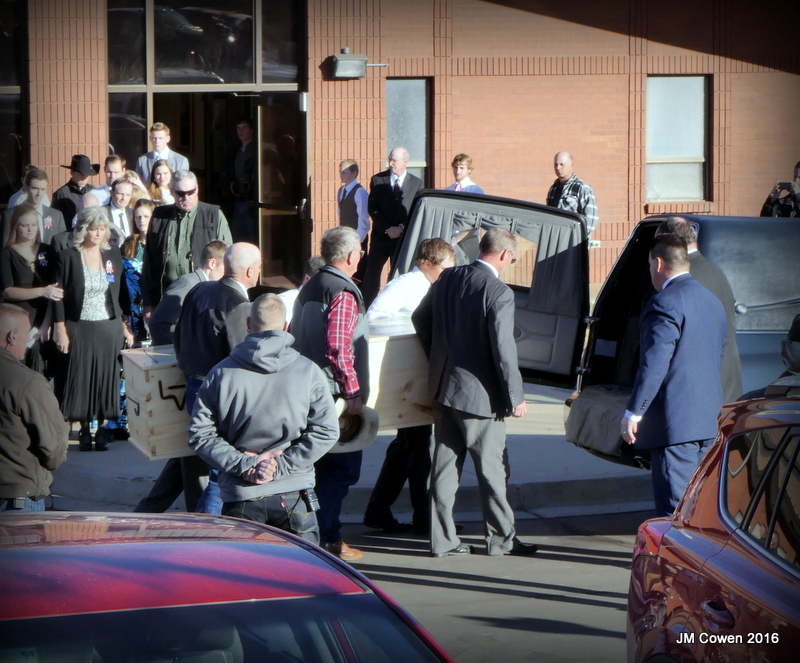 They lie – about everything – and steal and murder. And LaVoy had had enough of it. I’ve had enough of it. 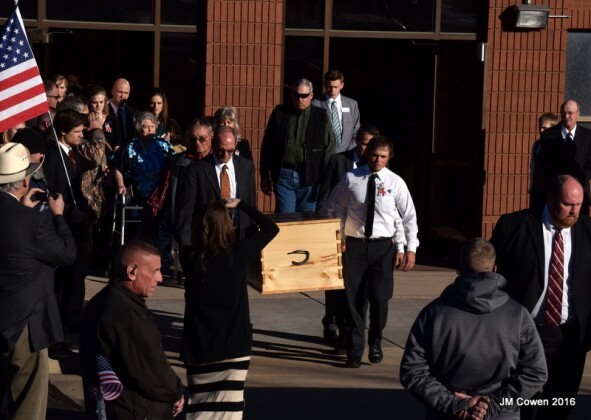 NEVER forget the “Legalized” murders of Sammy Weaver, Vicky Weaver, Donald Scott, Startle Summers age 1, Chanel Andrade age 1, Cyrus Koresh age 8, Star Koresh age 6, Bobbie Lane Koresh age 2, Dayland Gent age 3 Page Gent age 1, Crystal Martinez age 3, Isaiah Martinez age 4,Joseph Martinez age 8, Abigail Martinez age 11, Audrey Martinez age 13,Melissa Morrison age 6,Mayanah Schneider age 2, Startle Summers age 1, Hollywood Sylvia age 1, Serenity Jones age 4, Chica Jones age 2, Little One Jones age 2 and the other 64 people who were burned to death in Waco Texas. And how about the MILLIONS killed by the military for the bankers? And yes, LeVoy was the one in the RIGHT. But hey, they have the psychos willing to murder us for standing up. Even with our hands up. Reaching for his gun? They know they are lying. He knew he was surrounded by fbi agents with loaded guns that’s why he had his hands up. Shortly after the FBI released the video I watched it and there was sound with it! I showed it to my nephew. We watched it multiple times. They were shooting at Finicum before the pickup stopped. He got out of the pickup and put his hands up and they kept shooting. He got hit from behind and looked like he was turning to see who had shot him, then the sniper in back shot him again, and he fell down. Suddenly I couldn’t find the video with sound, I tried to return to the same website, but I couldn’t go back…the sound was gone. Surreal and terrifying. Thank you for posting this. I believe you and maybe there are others who heard it. We also believe he sped off because the FBI started shooting at the truck. I would have done the same! The government are liers. They murder and plunder for their own greedy reasons. We cannot trust them to choose what is right. They are driven by greed and power. “We the people” Must fight for our rights. 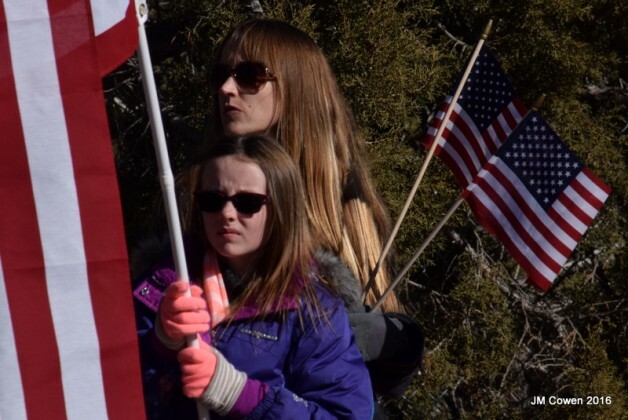 May Heavenly Father bless the Finicum family and may Heavenly Father bless America. And may our God in Heaven bless “We The People” as we struggle to regain our freedoms. 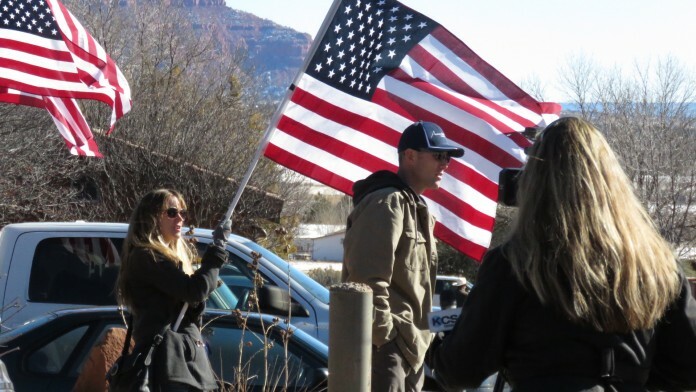 well Anonymous released the “REAL” video…unedited, and they stand with the Bundys…said they are going after the feds…released 9000 FBI names phones and email addresses yesterday. This sickens me. I am so sorry thisan had to die this way but to think this family defiled that chapel and church is what really sickens me. Our teachings are to obey our elected leaders and the laws of the land. He was may have been a principaled man but very wrong about the constitution. That made him a criminal subject to arrest. instead of submitting to arrest like the others, he evaded arrest. The iauthorities used restraint during the evasion. His criminal actions led to ultimate outcome. 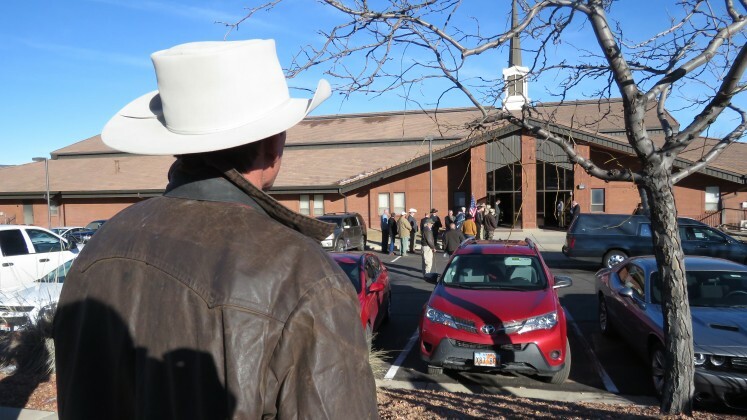 Thank you, God, for protecting our law enforcement from terrorists like LaVoy Finicum. Amen. He wanted to be a martyr, and got his wish. 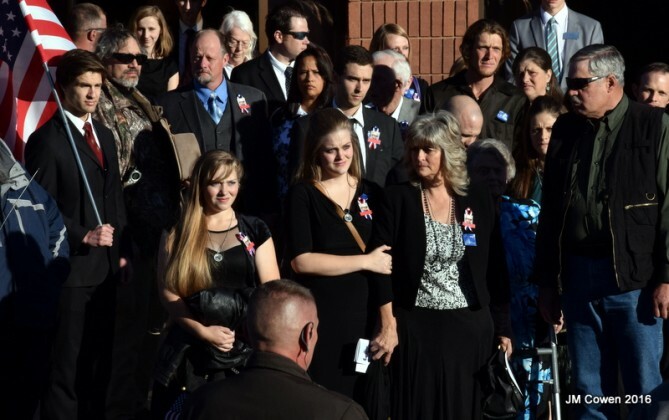 If the FBI wanted to kill him, that would beg the question of why the others with him didn’t get shot as well. When you make public statements about how you would rather die than go to prison, you are indicating that you are perfectly willing to defy or attack government agents. 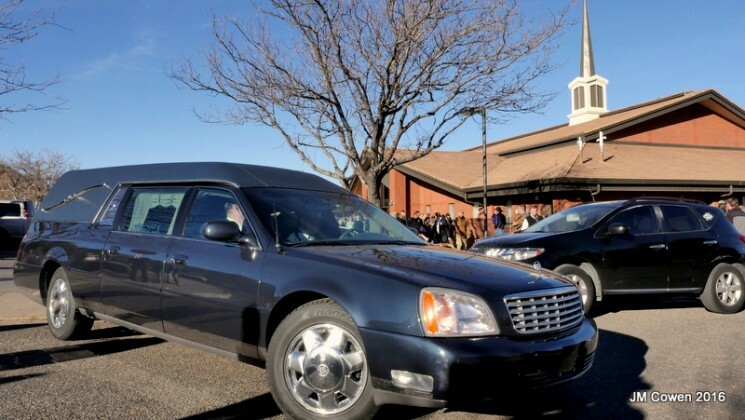 He got out of his vehicle, and then reached in the vicinity of his gun. What happened next was due to his own actions. 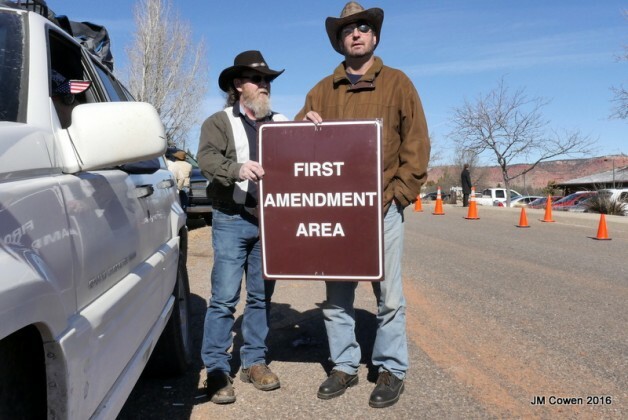 The man was a domestic terrorist, who thought he was within his right to take over public property because he didn’t agree with some legislation. I can only imagine the response here if this was, instead, some radical Islamists who decided to take over the same site. They thought might made right, and then tried to slink away with no consequences when they saw that wasn’t going to happen, making “demands” that the FBI let them get away without charges. My sincere condolences to any people left behind, who loved him. 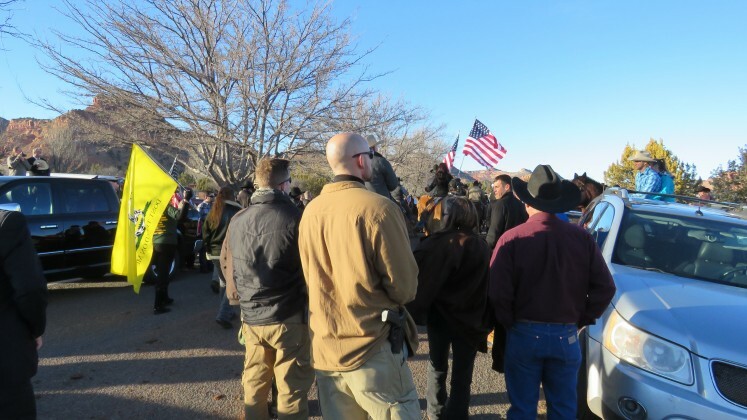 That doesn’t mean you stick your head in the sand and pretend these FBI agents wanted to murder one particular militia goon for… reasons… while curiously arresting the rest of them without a shot fired. 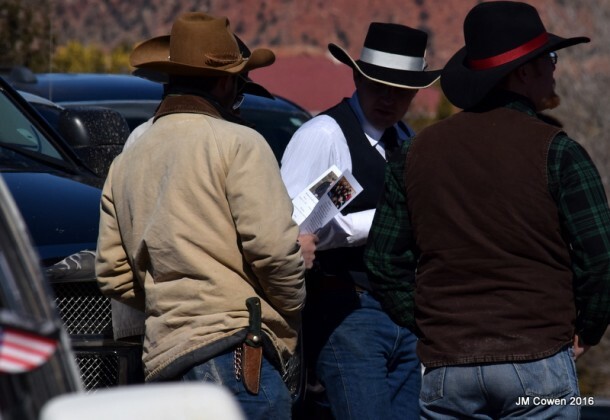 It’s almost like the FBI thought Finicum was armed and dangerous for some reason! Couple this with the arrest of the old man who liked to graze his cattle on the backs of Joe Taxpayer, and today was a good day for sanity. Rest in peace we will not forget this injustice to all Americans! It’s sad that many of our children are learning hatred and intolerance from this toward multiple sides. The FBI aren’t always right and the same goes for everyone else involved. Why can’t we resolve issues without guns? In my opinion, when a weapon is involved, there is little to do with peace or peacefulness. I am all for gun ownership, I just don’t think they should be used to make a point. The only thing at the end of a gun barrel is aggression and defensiveness. Neither one seems to point to resolution.